We have just come through a summer that was largely defined by irregular and extreme climate conditions. The National Oceanic and Atmospheric Administration (NOAA) reports that, “Scorching temperatures broke heat records around the world last month [July], which ranked as the fourth warmest July on record. Excessive warmth during the first seven months of 2018 made it the fourth warmest year to date for the planet.” Here in New England, we endured record-setting heat, high humidity, and chronic downpours. Those of us who grew up in the Northeast remember hazy, hot and humid stretches that would last a few days and be followed by a thunderstorm that cleared the air. This year, thunderstorms came and went without refreshing the atmosphere, creating sauna-like conditions referred to by some meteorologists as a “heat dome.” Out West, the story was extreme heat, drought, and fire. According to NOAA, “Death Valley had the hottest month on record observed anywhere.” Other parts of the country and the world also baked. 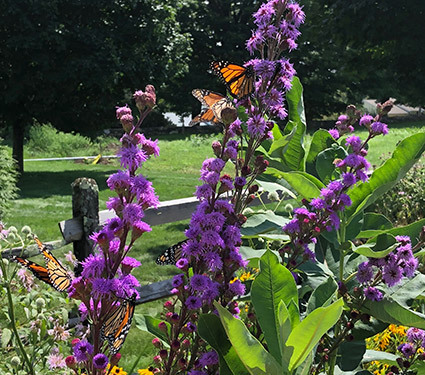 Monarch butterflies (we count 5 in this photo) feeding on the nectar of Liatris scariosa. Another way to combat uncomfortable heat levels and changes in climactic conditions is to help creatures great and small that are also being affected by it. Add native plants to your garden and yard to provide habitat and nourishment for birds, pollinators, and other wildlife. 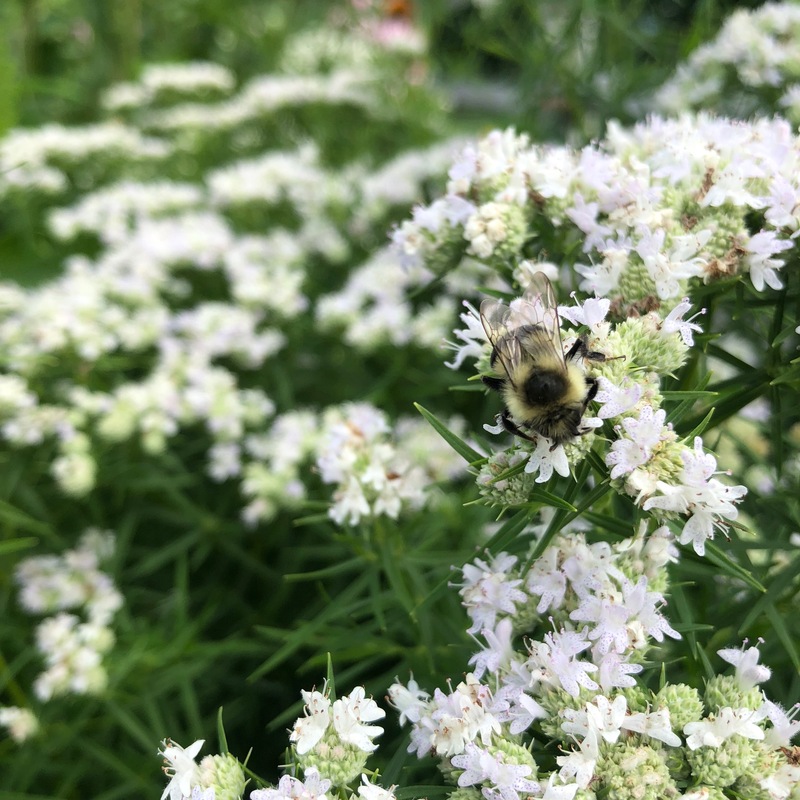 In lieu of maintaining a manicured green lawn that often requires chemicals to keep it looking its best, eliminate or reduce the size of your lawn and create a native garden for pollinators. The beauty of these gardens is enhanced by its visitors, which include butterflies of many varieties, and birds. Come spring, we’ll be offering some exciting collections that will help you successfully convert some of your lawn area into a beautiful habitat garden. So begin thinking about where you’d like to site such a garden, and stay tuned for details. This Bumblebee is enjoying the nectar of Pycnanthemum tenuifolium (slender Mountain Mint). 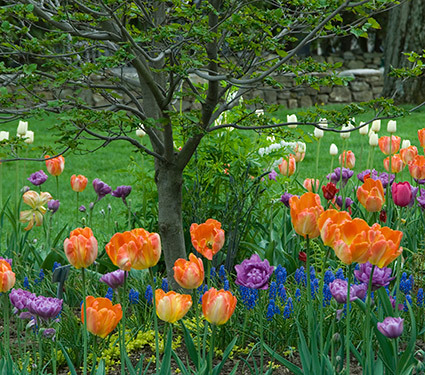 Record heat around the globe has impacted the lifecycle of the bulbs we offer for fall planting. Higher temps have led to later harvest times in regions including Holland, England, British Columbia, and Japan. That means bulbs produced in these countries will arrive in the U.S. a bit later than usual. Rest assured these top-grade bulbs will be treated with the same consideration that’s required to keep them healthy and strong. They’ll be shipped overseas in temperature-controlled containers then stored here in our warehouse under ideal conditions before being shipped to you for fall planting. We don’t foresee any delays in getting bulbs to you. Order now, and incorporate some of these beautiful flowers in your spring garden. The solar project is installed at the farm. 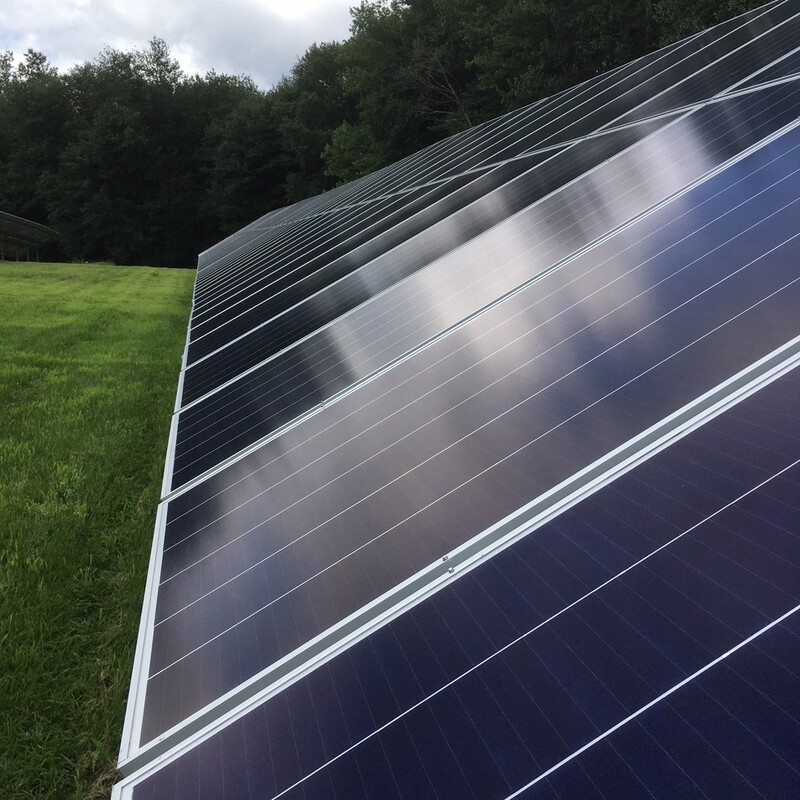 At the farm this summer, the big news was the successful installation of our solar array, which means the farm’s offices and greenhouses are now powered by the sun. We’re pleased to have taken this important step in reducing our carbon footprint. The beginnings of our new Rose Garden, which will feature a variety of Roses and some of their favorite plant companions. The other big development at the farm this summer was the installation of a new Rose Garden on the site formerly occupied by our Shrub Border. 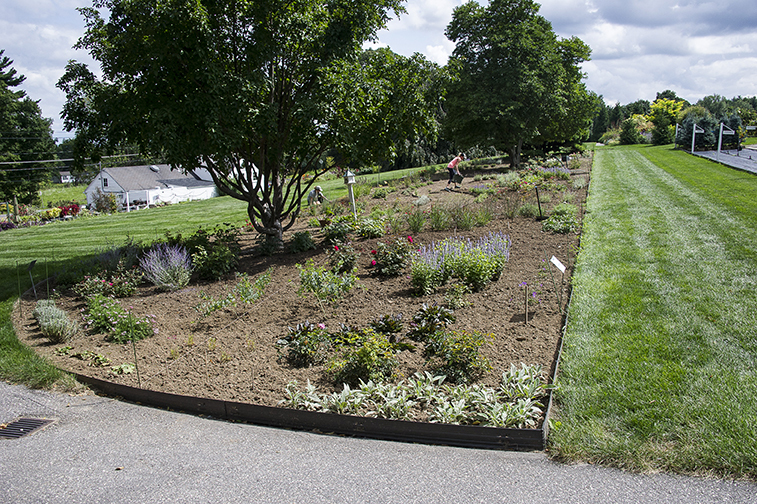 The Rose Garden was designed with the assistance of noted landscape architect and designer Julie Moir Messervy and her talented team at JMMDS (Julie Moir Messervy Design Studio). Site prep began in July, and as of this writing, the garden is in its earliest stages. The bones have been laid out, with pathways delineated, plant groupings sketched in and in some cases planted. Even in skeletal stage, the garden is shaping up to be a most inviting and pleasing space. Several entrances and a winding path welcome visitors to stroll. The short walk will offer a chance to view a wide variety of Roses along with some superb companion plants. Planting of the garden will continue into autumn, and come spring, we’re all looking forward to its first season. We hope you’ll visit soon to have a look at the outline, then plan to return again in spring and summer to see how it progresses. There is no better way to see how new gardens are created and to borrow ideas for inspiration. 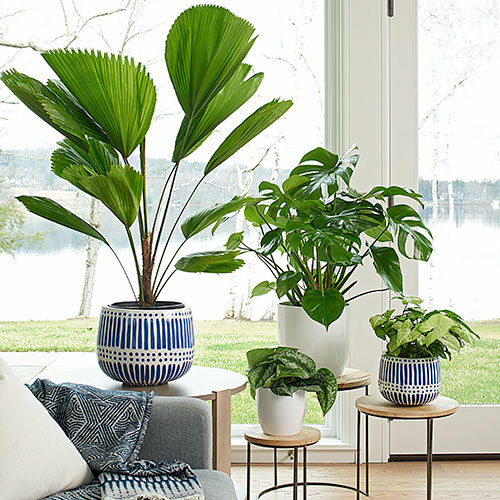 Among the season’s new houseplants is the Ruffled Fan Palm, far left, in our Blue Dots Motif cachepot. Did we mention it’s selling like hotcakes? As the days grow darker at an earlier hour, and the temperatures (finally) begin to cool, those of us who love plants, greenery and flowers are looking for ways to bring the garden indoors for the winter. In our holiday catalog, which soon will be speeding its way to your door, you’ll find some stunning new houseplants along with new cachepots, baskets and plant stands that show them off to best advantage. (If you care for a sneak peak, many of these items are already on our website.) Our hard goods manager has been hard at work, and she’s rounded up some exciting new finds for indoor decorating – from botanically inspired dried wreaths in a wide array of styles and color themes to scented candles and sachets that carry the natural perfumes of Lavender and other garden favorites, to tiny plants that are ideally sized for table setting, and which make beguiling party favors for autumn and holiday feasts. We trust you and yours are looking forward to autumn and its many pleasant rituals. We’ll be spending as much time as we can in the garden, clearing out beds, adding new perennials and shrubs, planting bulbs, and creating the displays we wish to see next year. As you choose what to plant in your garden this fall, keep in mind that next season’s flower and foliage show is one you’ll likely share with family, friends and, depending how visible your house is to your neighbors, members of your community. Beautiful gardens do much to lift the spirits, bring beauty (and value) to your house and the neighborhood, and, as mentioned above, support pollinators and wildlife. Plant some lovely additions in your yard. It’s a terrific way to make the world a better place, one green oasis at a time.